Ohh, wait, I did not know how could Jenkins read parameters from a given key=val file and pass it on further. We actaully wrote another shell script which runs as the first step of every job and reads the testcase_name.checks file and set ENV variables like for example BASE_URL. 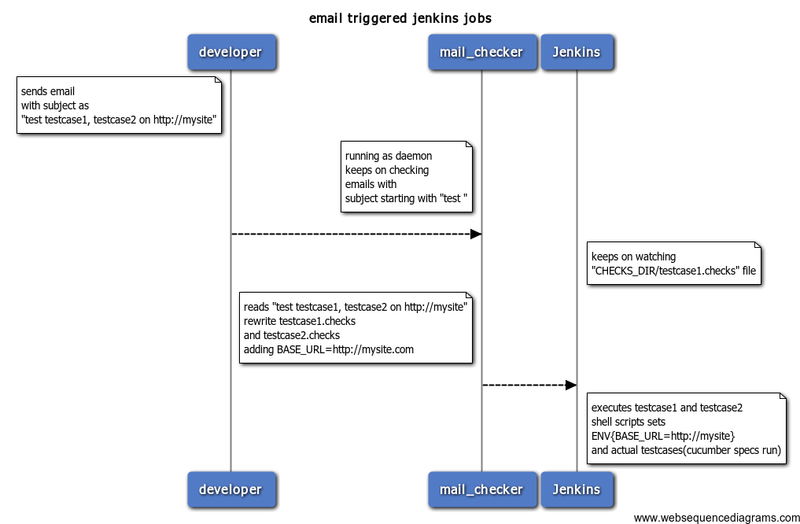 Following is the mail watcher that we simply run to be able to get Jenkins job triggered. Now any of us teammates, can anytime send an email and get a test case executed. In addition we are as well generating a detailed report email for each job-run that gets published on a Google group. We do have our own custom, half-baked, reporting mechanism(ruby code), which we want to compile the job-execution-report email for each testcase/job executed. subject: rspec 231 passed, 2 failed.